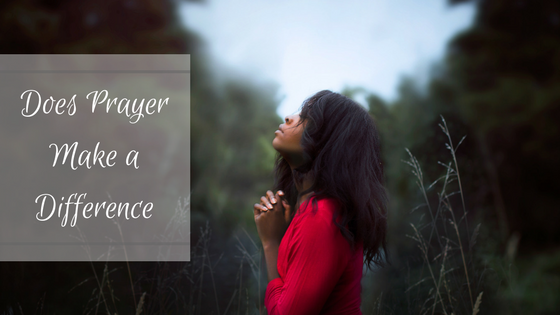 Have you struggled with the question “Does prayer make a difference”? Have you wrestled with God over why He allows trials, sufferings, difficulties, sickness, etc.? So, why pray? Does it make a difference? Does it do any good for us to pray against a nuclear threat, against terrorism, and against hurricanes and global climate change? In what often seems like a troubled political world, why does God let history lurch on without intervening? Does prayer make a difference? To some people as George Buttrick put it, prayer seems, “a spasm of words lost in a cosmic indifference.” We pray, but nothing seems to happen; or what does happen is the very thing we prayed against. Consequently, prayer is a waste of time to the skeptic. To many of us, we acknowledge that prayer is important. Yet as we breathe out our prayers, we breath in an atmosphere of doubt. However, to God, prayer is the place where he meets us personally and transforms us from self-centeredness to God-centeredness. This life is marked by a single choice: who or what will we center our lives around? That choice takes us down a path of decisions that shape who we are, what we feel, who or what we value, and what we will have accomplished at the end of our days. To center our lives around ourselves or the things of this world leads only to great disappointment and even destruction. On the other hand, to center our lives around meeting with God fills each moment with the glorious abundance of God’s love, provision, and transcendent peace. That is a difference you can’t live without! Sometimes we view prayer as God sitting in a room somewhere waiting for us to come to him. When we drum up enough desire to go to him, we might receive a blessing from him, but we believe the weight of choosing him is all on our shoulders. The truth is, we serve a God who constantly and powerfully pursues us. In Revelation 3:20 he says, “Behold I stand at the door and knock. If anyone hears my voice and opens the door, I will come in to him and eat with him, and he with me.” In reality, God is knocking at the door of your heart right now. With every beautiful sunrise and every breathtaking star in the night sky, God is declaring his love for you. God pursues us in any and every way he can. The greatest desire of his heart is for time spent with you. So, it is in knowing and receiving his overwhelming affections for us that our hearts will be stirred to meet with him. It is in taking time to notice his constant pursuit of us that we will naturally begin to center our lives around meeting with our heavenly Father. Also, when we do this, it will completely change us and the choices we make today. The choices we make today will impact us for the rest of our lives. Does prayer make a difference? Absolutely! It is a difference you really do not want to live without. Why not spend some time meeting with God today?